There was a woman who had been diagnosed with cancer and had been given 3 months to live. Her doctor told her to start making preparations to die (something we all should be doing all the time). So, she contacted her pastor and had him come to her house to discuss certain aspects of her final wishes. She told him which songs she wanted sung at the service, what scriptures she would like read, and what she wanted to be wearing. The woman also told her pastor that she wanted to be buried with her favorite bible. Everything was in order and the pastor was preparing to leave when the woman suddenly remembered something very important to her. "There's one more thing," she said excitedly. "This is very important", the woman continued. "I want to be buried with a fork in my right hand." The pastor stood looking at the woman not knowing quite what to say. "That shocks you doesn't it?" the woman asked. "Well, to be honest, I'm puzzled by the request" said the pastor. The woman explained, "In all my years of attending church socials and functions where food was involved (and let's be honest, food is an important part of any church event, spiritual or otherwise), my favorite part was when whoever was cleaning away the dishes of the main course would lean over and say, 'You can keep your fork.' It was my favorite part because I knew something better was coming, when they told me to keep my fork. I knew that something great was about to be given to me. It wasn't Jell-O or pudding. It was cake or pie something with substance. So I just want people to see me there in that casket with a fork in my hand and I want them to wonder, ' What's with the fork?' Then I want you to tell them: Something better is coming so keep your fork too." The pastor's eyes were welled up with tears of joy as he hugged the woman goodbye. He knew this would be one of the last times he would see her before her death. But he also knew that that woman had a better grasp on heaven than he did. She KNEW that something better was coming. At the funeral people walked by the woman's casket and they saw the pretty dress she was wearing and her favorite bible and the fork placed in her right hand. Over and over the pastor heard the question, what's with the fork? And over and over he smiled. During his message, the pastor told the people of the conversation he had with the woman shortly before she died. He also told them about the fork and told them about what it symbolized to her. The pastor told the people how he could not stop thinking about the fork and told them that they would probably not be able to stop thinking about it either. He was right. 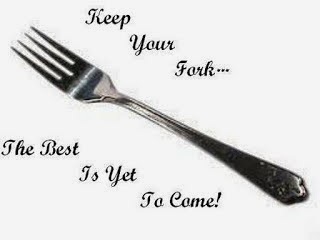 So, the next time you reach down for your fork, let it remind you, oh so gently, that there is something better coming!